Other Products by Rule 1. Search other Protein Powder products. * cost per serve based on 5lb, 70 serving size. 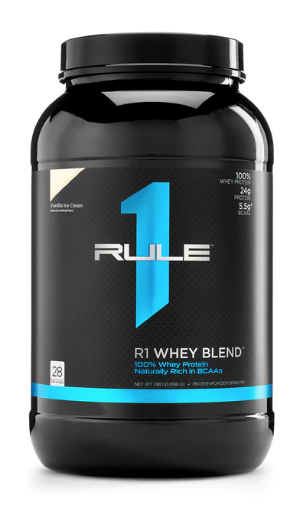 Rule 1 R1 Whey Blend is a new protein by the company Rule 1. It is a whey protein isolate, whey protein concentrate blend. It has added whey protein hydrolysate which is a hydrolysed form of whey protein. Whey protein hydrolysate is when they take a whey protein isolate and they enzyme predigest it, to provide a faster and more complete absorbing protein powder. By having a mix of whey protein concentrate, whey protein isolate and whey protein hydrolysate, you can get all of the varied benefits of having all of the best absorbing versions of protein without having to pay a premium cost. 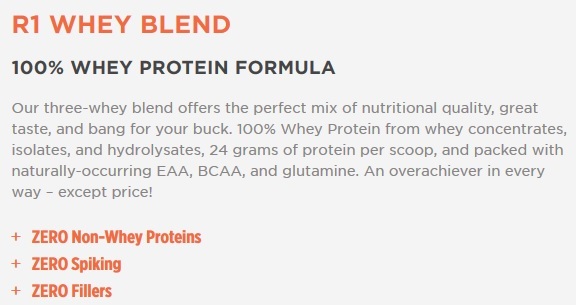 The addition of a whey protein concentrate, which is more abundant in dairy protein, significantly reduces the price per serve of R1 Whey Blend. Whey protein isolate is typically seen as the premium protein, however a whey protein concentrate does actually absorb very similarly to whey protein isolate. Basically because Rule 1 R1 Whey Blend is a high protein, low carbohydrate protein powder containing very well absorbed protein, it is a superior way of increasing protein in your diet. When exercising at a high intensity muscle tissue gets damaged. Due to this muscle damage more protein intake is required. By taking a supplement like R1 Whey Blend you can meet this protein requirement, allowing your body to build more muscle faster and also recover more rapidly, reducing muscle soreness and stress on your body. 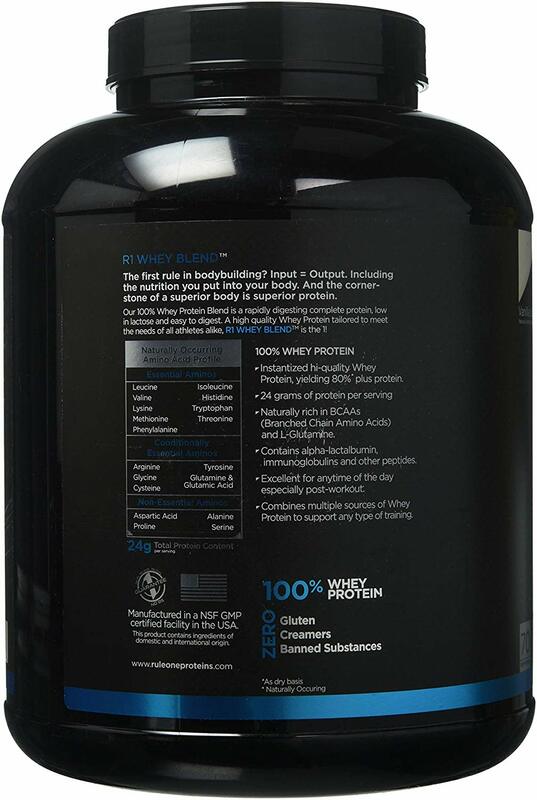 Due to the forms of protein in the R1 Whey Blend your body is not limited by poor absorbing proteins and you are getting the full benefit of all proteins in this product. Anyone that is exercising three times per week or more in either endurance and aerobic or weight training should use a protein powder like R1 Whey Blend. The detriment of not increasing your protein intake whilst increasing your exercise levels can be quite significant. By under recovering your muscle tissue is not fully repaired and then under functions and you under perform during exercise. If you exercise three times per week you should take approximately 1.2 to 1.4 g of protein per kilo of body weight per day. If you're exercising 4 to 6 times per week then you really should be looking to increase your protein intake to 1.8 g of protein per kilo of body weight per day. This is a significant intake of protein which is quite difficult to get from a normal diet as protein foods are typically only 17 to 20% protein per weight. Even if you were to eat 200 g of chicken twice per day that only equates to 68 g of protein for the day where 1 serve of our R1 Whey Blend contains 24 g of protein. Rule 1 R1 Whey Blend is a fast release, fast absorbing protein powder to be taken typically post workout or between meals. 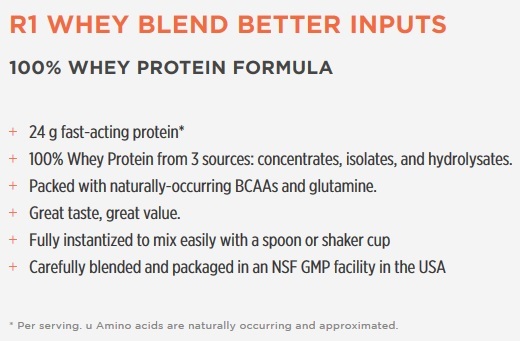 Any Whey Blend will absorb significantly faster than a casein style protein powder. The purpose of a casein-based protein is typically to be taken only at nighttime 30 minutes before bed. People using a casein protein post workout can miss out significantly on absorbing all of the amino acids from their protein during what is called the anabolic window. 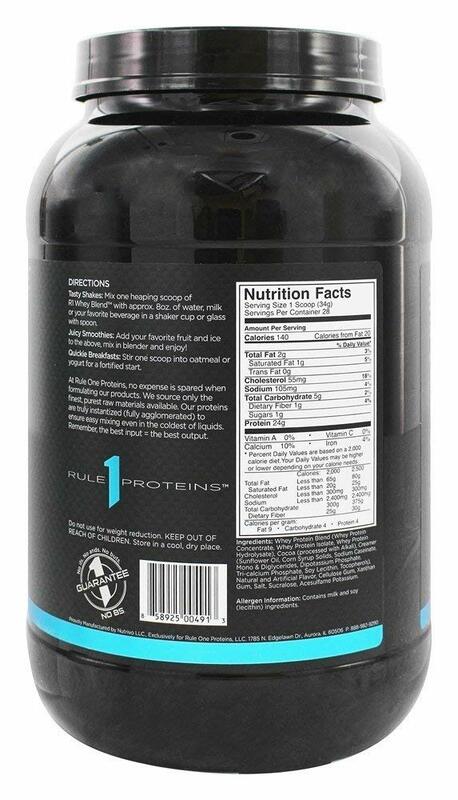 Taking Rule1 R1 Whey Blend during the anabolic window, which extends for approximately 1 hour after workouts, will allow the full protein and all of the amino acids to be fully absorbed by your muscle tissue to start the recovery process. So in summary the best whey of using Rule 1 products together are to take the R1 Whey Blend post workout and in the morning, and use the R1 casein at night time between dinner and bedtime. INGREDIENTS: Whey Protein Blend (Whey Protein Concentrate, Whey Protein Isolate, Whey Protein Hydrosylate), Natural & Artificial Flavours, Emulsifier (Lecithin), Inulin, Thickeners (Xanthan Gum), Sodium-Carboxymethylcellulose), Sweeterners (Sucralose, Steviol Glycosides). **Total protein quantity includes the listed amino acids which are naturally found in the Whey Protein Blend.